UPDATE: 1:37pm. 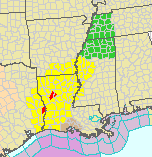 Tornado watch (yellow) and tornado warnings (red) are out along with a flash flood watch (green). Updated warnings available at AccuWeather. Here is the NWS Storm Prediction Center's outlook for tornadoes today. 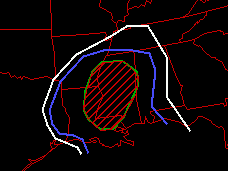 There is a threat in the entire outlined area with strong tornadoes possible in the hatched region.